1) NLA Her Whey RV $54.99 – 28 grams of protein in each serving! 18 servings in this 2lb tub. Delicious chocolate flavor with zero sugar and packed with aminos! 3) Apple Cinnamon Protein Cereal by Kay’s Naturals 9.5 oz. RV $7.99 – If this tastes anything like Apple Jacks, count me in! Gluten free, kosher, zero sugars and additives with 12 grams of protein and 4 grams of fiber per serving. 4) High Protein Coffee by Chike Nutrition 2 Packets RV $5.99 – Each packet contains 20 grams of protein with the caffeine equivalent of 2 shots of espresso. Mmmm! 5) Pumpkin Spice Complete Cookie by Lenny & Larry’s 2 Cookies RV $5.98 – Vegan, zero animal by product, zero dairy, no preservatives with 16 grams of protein and 6 grams of protein per cookie! 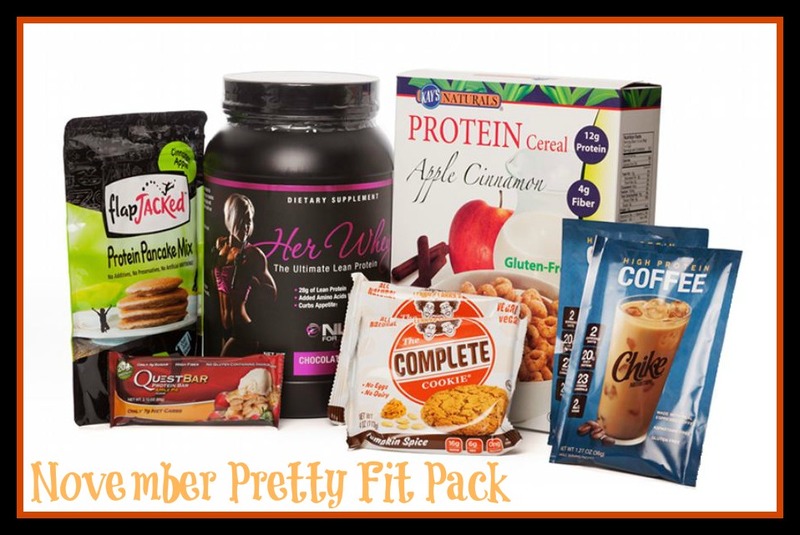 This entry was tagged apple cinnamon, cereal, coffee, cookies, espresso, fall, fit, fitness, health, healthy, NLA, nutrition, nutrition subscription, prettyfitpack, protein, protein bar, protein cookies, pumpkin, pumpkin spice, quest bar, whey protein. Bookmark the permalink.